I've been making a lot of cards, but I've only gotten one photographed so far. I decided to do a quick post so I didn't miss the challenges. The pretty holly garland and bold sediment are both NBUS from the "Fa La La" set by Avery Elle. The red is Washi tape. The textured card is linen from Handy Hippo. Tic Tac Toe Challenge: "Die Cut, Free, Leaf." And "Sentiment, Die Cut, CAS." I think it's a type of Phlox? Aren't the teeny-tiny buds within the sphere of flowers so fascinating? They are like little pillows. Can you see it? I'm pretty sure I've shown you one of these before, but it's been ages since we've seen one. That's a good thing because I think they are pests and bad for the trees if you get an infectation of them. The leaf pattern on the body really mesmerizes me, though. Its official name is Katydid (Leaf Bug). Oops, a certain little hamster is squeaking at me. I forgot I left him holding down a section of ribbon so I could finish tying a bow! Very nice card. And I love your photos, especially leaf bug. Beautiful card, Darnell, and such a great take on the sketch! Your nature photos are wonderful - I've never seen a bug like that before! Oh my, what a beautiful card Darnell, the washi stripes really do make a wonderful statement and I just love the holly - an absolute stunner!! The flower is so, so pretty, I wish I could help with the name but I can't, although I would love to have one in our garden. The leaf insect is pretty spectacular, his camouflage is superb - just a pity he is such a pest!! That flower is just gorgeous! Pretty card! Awesome nature photos. The flower looks like maybe a Lantana. oh those photos are great! that bug look so likea a leaf! Wonderful take on the sketch, Darnell! What a great card, Darnell, and a fabulous use of the sketch! I love the holly. I hope Hammy didn't get a cramp while you left him for so long holding down the ribbon:) Awesome picture of the leaf bug, too. Very cool! I don't think I've ever seen a leaf bug before. A walking stick - yes. Leag bug - no. Oh, I do love that card. The holly vine is so pretty and the red washi is so bright and happy. The plant is so different from anything I've ever seen and a leaf bug is also new to me. How unique he is. I wish I had someone to hold ribbon for me to tie a bow. You are so lucky Hammy likes to craft. Molly only likes to sleep and eat. That bug is absolutely incredible--had to enlarge the picture to see it! Gorgeous bloom in your garden--pretty much everything is gone here as the rain has ruined the roses. 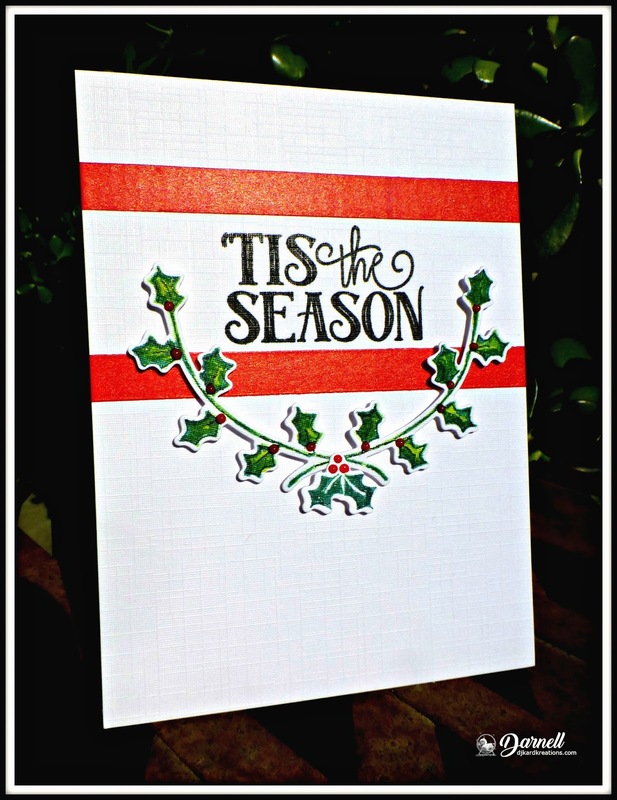 I truly adore your card, Darnell--totally nailed the sketch with those wonderful AE products! The swag is gorgeous--need to see if I can do something like that with what I have & I always admire use of Washi which I can never seem to use! Happy Sunday, my friend! You nailed the CAS(E) This Sketch perfectly. As I'm acquisitive, I'm experiencing shopper's envy over that die. Surprisingly, never seen it before. Such a clean, lovely Christmas card and a winner in my book. Your card is so lovely, Darnell. Always love red, white & green so festive. Fabulous card Darnell, like the curved greenery partially framing your sentiment. What a cute and clean holly card with the Avery Elle stamps! Love the linen paper, too, and the Washi tape helps speed up the process. 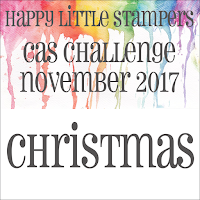 Gosh, you could make a bunch of those fairly quickly, but you probably have way too many fun Christmas stamps to stay on one set too long (like me). How lovely it is to see your pretty yellow flower and the sunshine in your card photo. The leaf bug is completely fascinating! Nature is really something! Fabulous take on the challenge. I love the red washi and the sweet garland. You rocked that sketch for sure. Love the card, Darnell! That bug in your photograph is amazing. Took me a minute to see it! Those flowers are so pretty. Thanks for your comment on my blog post! Sure means a lot. Beautiful CAS card! 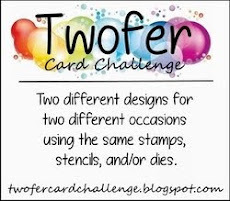 I am in the same boat where I made a lot of cards lately, but need to photograph them! (Or just forego some of the blogging of the cards). I like the leaf bug! I didnt know they were pests! I think it's a Katydid. I love your gorgeous card with the holly and lovely sentiment. The colors are wonderful too. And, love the pretty flowers you shared as well. And, as to the bug, I have seen that kind around here too in summer but not sure what it is. It sure blends in well with the leaves. Lovely festive card, Darnell. 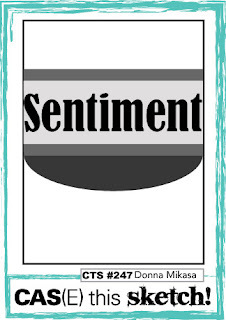 I think your card also satisfies the left column too (sentiment - diecut - CAS). Such a clean, crisp and stunning card. Great take on the sketch too x Wow on the leaf bug!! Beautiful card and great take on the sketch. Love the pretty holly garland. Another stunning card, definitely a case of LIM on this one, now if I could have put a line through the e on case it would CAS too. When I was little there was a series of girls books called What Katy did, What Katy did at school, and so on, never realised that there was a tree bug called Katydid. I love this Christmas card you created, Darnell. It is pretty and fun at the same time. Does that make it pretty fun? LOL! Thank you for sharing the nature pictures with us, also. I love seeing the little yellow flowers. They are so delicate! I don't ever remember seeing a leaf bug before! That is some camouflage! God's handiwork is always amazing to see! Very nice interpretation of the sketch. I like the bright red stripes that really catch the eye. Speaking of eye-catching, your flora and fauna photos are fantastic! And how's that for a little alliteration? Have a great week. Great card and take on the sketch. You were missed this weekend but you still brought a smile to our faces when we recounted the Miss America 'pageant'! I love this gorgeous festive design Darnell and its such a fabulous take on the sketch! The holly swag is beautiful and I love the textured card. When I saw your yard art, I had to call John in to see your amazing leaf bug and he says hi! Gorgeous card... and I've still not started mine! Eeek! 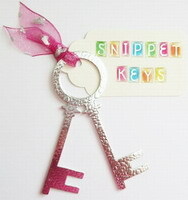 I am planning on doing some die cutting prep tonight though! I love how you've interpreted the sketch, Dolly! So bright and pretty! And Mother Nature can't be beat! ...hope you didn't hit the floor too hard after fainting when you saw my comment pop up in your mailbox! I'm off today and decided that things like laundry, dusting, supper, etc are taking a backseat to very overdue blog visits! ADORE the holly berry ivy die! 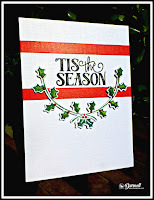 What an easy-peasy way to create a quick and super cute Christmas card! Looks like you shimmered up the berries and leaves - looks great! 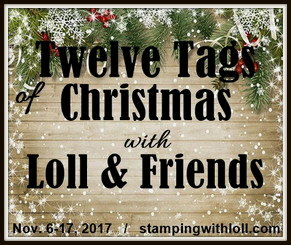 I'm actually going to start my Christmas tags once I finish my blog visits! Kind of excited to get inky again! Might even post a pic....if I like them enough! This is a great CAS card! thank you for playing along at the Tic Tac Toe challenge! Beautiful card Darnell! I love the washi...great idea. I'm always looking for ways to use washi...love the stuff! Wonderful card, great interpretation of the challenge! Love the deep green and bright reds smothered in white! Super card. Love how you interpreted the scene. And fotos are gorgeous. Morning! I love your take on the sketch - perfecto. More amazing photos. That leaf bug is so very camouflaged! it isso interesting...have not seen anything like it. The phloxis so pretty and your card is of course, wonderful! Lovely card Darnell! You are so good at CAS! That leaf bug is so cool! I've only seen one of those a couple times--love how they are so disguised! That garland is lovely surrounded by two perfect red stripes, Darnell. 'Tis the season for sure. Those stripes and the garland are beautiful together. Such a great project, Darnell! I love how the holly wraps under the sentiment. 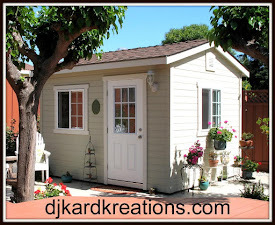 Such a sweet project! This is simply perfect! I love how crisp and clean it is! Gorgeous card and wonderful take on the sketch! Love the simple design with the lovely holly. Your nature photos are always a joy, especially when we no longer have blooms here. Fun little katydid too! Congrats on your CTS win, Darnell! Your card is well deserving. 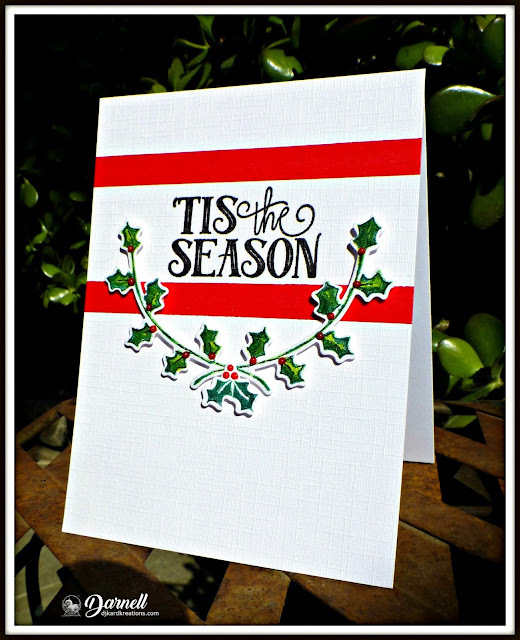 Love the textured card stock, and the spray of holly leaves was a brilliant take on the sketch! It's a winner! As it should be: CAS perfection! Hurrah! Big congrats on the win at CTS, Darnell! I never enter there as I know there's no point. Love seeing my friends noticed! You, my dear, are on a spectacular roll...CTS win is difficult to get and you did it with ease. Gorgeous card and a well-deserved win. Congratulations. Very nicely done Christmas card! The card is what I came to see, but what a great post on top of that. I think the flower might be lantana. I loved seeing the leaf bug. He's so great at blending in! Thank you for all you shared. Super festive creation. The linen card does add a lovely texture. The flower does look phlox-like and the leaf bug is certainly good on the camouflage front.